Identification: Three strong keels on the carapace, which is usually brown. The legs are webbed and the tail is quite long. Coloration: body usually grey with yellowish spots and the head has a pattern of stripes. Some Reeve's turtles entire body and soft parts might be dark brown or completely black. Reaches sexual maturity in China at 4 to five inches; grows as large as 14 inches in Japan. Native Range: Mauremys reevesii is native to most of temperate and subtropical China, North Korea and South Korea; populations also occur in Taiwan, Hong Kong and Japan (van Dijk, 2013). Table 1. States with nonindigenous occurrences, the earliest and latest observations in each state, and the tally and names of HUCs with observations†. Names and dates are hyperlinked to their relevant specimen records. The list of references for all nonindigenous occurrences of Mauremys reevesii are found here. Means of Introduction: Pet escape or release. Status: Failed in California, Guam, and Massachusetts. Behler, J.L. and F.W. King. 1979. The Audubon Society Field Guide to North American Reptiles and Amphibians. Alfred A. Knopf, Inc. NY. Cardoza, J.E., G.S. Jones, T.W. French, and D.B. Halliwell. 1993. Exotic and translocated vertebrates of Massachusetts. Massachusetts Division of Fisheries and Wildlife Fauna of Massachusetts Series, Publication #17223-110-200-11/93-C.R. Volume 6. 95 pp. Conant, R. and J.T. Collins. 1991. A Field Guide to Reptiles and Amphibians: Eastern and Central North America. Peterson Field Guide Series. Houghton Mifflin Company, Boston. Third ed. Ernst, C.H., J.E. Lovich, and R.W. Barbour. 1994. Turtles of the United States and Canada. Smithsonian Institution Press, Washington, D.C.
Holland, D.C. - herpetologist, Fallbrook, CA. Leberer, T. 2003. Records of freshwater turtles on Guam, Mariana Islands. Micronesica 35-36:649-652. Spinks, P.Q., G.B. Pauly, J.J. Crayon, and H.B. Shaffer. 2003. Survival of the western pond turtle (Emys marmorata) in an urban California environment. Biological Conservation 113(2):257-267.
van Dijk, P.P. 2013. 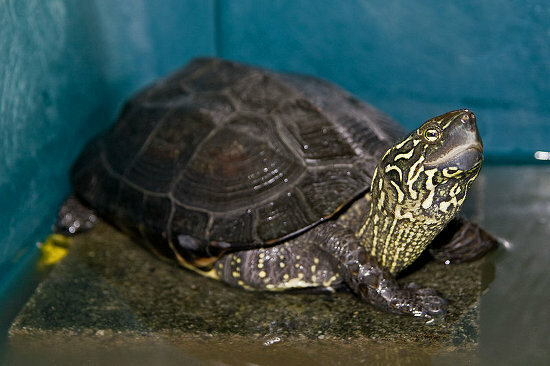 Mauremys reevesii. The IUCN Red List of Threatened Species. Version 2015.2. http://www.iucnredlist.org. Downloaded 23 July 2015.